Get ready to purchase the perfect beginner’s bow. Every budding archer has to start somewhere when they decide that they are interested in archery. This bow is a wonderful place for most to start! With a left/right orientation (meaning you can hold the bow with either your left or your right hand!) it’s not specific to a left or right handed person. It’s also a very attractive bow – with maple limbs and black fiberglass that is sure to appeal to any archer. It’s always nice to look good while shooting at the range, and with this Samick Sage Takedown recuve bow you’ll feel your confidence increase each time you use it. 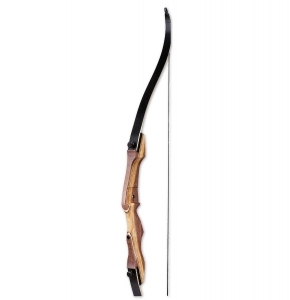 This Samick Sage Takedown bow is 62 inches long, perfect for an archer of almost any height. It allows up to a 29 inch draw. The bow does come strung and with an arrow rest, but that’s all of the accessories that you will get with this bow without separately purchasing more. There is a place where you can easily add a sight if you desire one once you’ve shot the bow a few times. The pre-drilled holes in the Samick Sage Takedown mean that it would be easy for the average archer to add accessories. If you experience trouble any archery shop would be able to help. This is a simple bow that’s perfect for beginner’s, and so the pros include that it doesn’t have tons of fancy gadgets attached to it that will distract from the main goal – learning to shoot a bow and arrow. It’s easy to take it apart without tools and can quickly be put back together again. As mentioned before, the bow is incredibly attractive, with a graceful curve to it that appeals to many archers. The limbs are secure and don’t come loose when shooting, thereby eliminating the need to make adjustments to your bow while on the range. As wonderful as the Samick Sage Takedown bow is though, there are some cons to purchasing this bow. Sometimes there are faulty bows that are manufactured, and the Samick Sage Takedown bow is unfortunately not immune to this. When that happens the limbs don’t line up correctly and are unable to be reattached and sometimes they snap even though they are supposed to be solid construction that will hold together for years to come. When cracks appear in your limbs and risers then the bow is no longer safe to use and you’ll have to figure out how to either get it fixed or replaced. All in all the online reviews of this bow are overwhelmingly positive. Of course, there are always some users who aren’t happy due to either a defective bow or their own inability in using it. It’s important to listen to and read these concerns but be willing to make up your own mind when it comes to any purchase – including a bow. The Samick Sage Takedown bow seems like a great starter bow. It’s gorgeous and easy to use without bells and whistles but you can easily add those as you grow and become more advanced with your archery. If you do decide to purchases this bow we recommend talking to the company about their warranty and immediately opening the box and inspecting it after the bow has arrived. It seems like most of the issues people have with this bow are discovered soon after purchasing it. Don’t let it sit in a box for months and then decide you’re unhappy with it – figure that out within the time period of the warranty. Otherwise this bow seems like a great purchase!